For this Month's We Knead to Bake, we are baking Gibassier / A French Anise & Orange flavored bread. 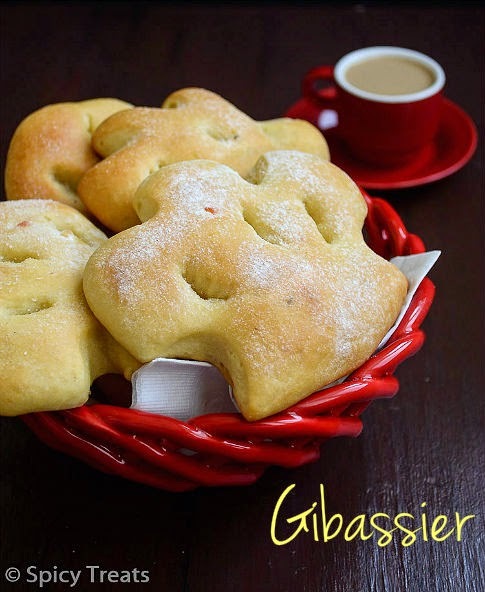 Gibassier is a French Breakfast bread that is flavored with Candied Orange, Orange blossom water and Aniseed. This is one of the popular French Bread that is baked during Christmas Occasion. These Gibassier are pretty shaped bread looks like a oval shaped leaves. Again this is also a new bread to me and baked it for the first time. This is a simple and easy bread with lengthy process. 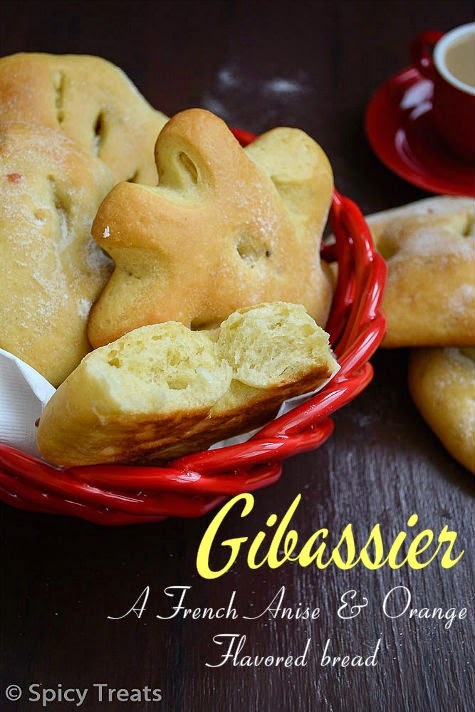 Gibassier needs Biga or pre-ferment that required 14-16 hrs resting time, so it should be made the previous night if you plan to bake this bread the other day. Very soft and delicious sweet bread with lovely orange and aniseed flavor. I don't find the orange blossom water, so i skipped and used Orange juice and double the orange zest. 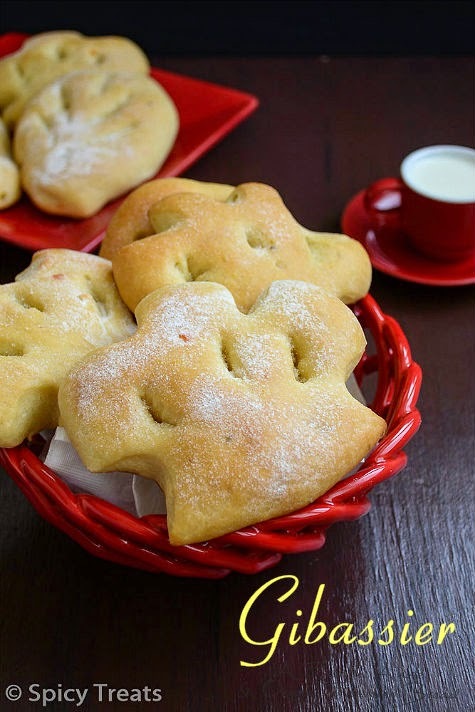 I shared this bread with my friends and everyone loved it, that too this is super hit with kids. Shaping Gibassier is pretty fun and time and patience required process, i used knife to make slits and star cutter edges to make snips. 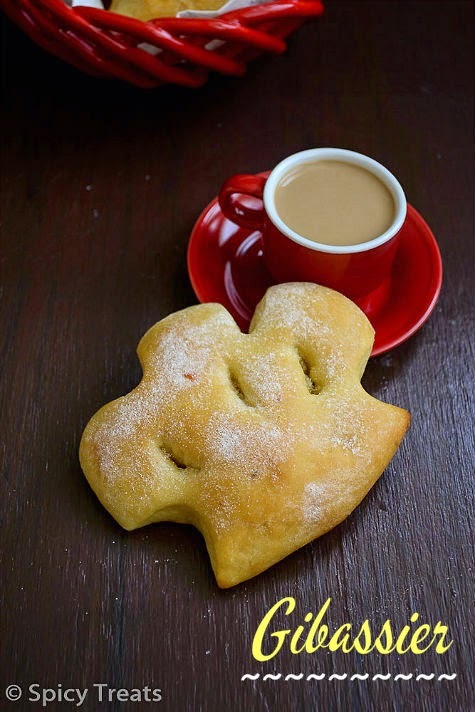 And i tried it as Eggless Gibassier, i just skipped Eggs and used warm milk. The pre-ferment has to be made the evening / night before the Gibassier are baked. So the previous night, mix together the ingredients for the pre-ferment into smooth dough. Add a little more milk if your dough is too stiff. Shape it to a ball and place it in a oiled bowl and wrap it with plastic wrap and rest it at room temperature for 14-16 hrs. 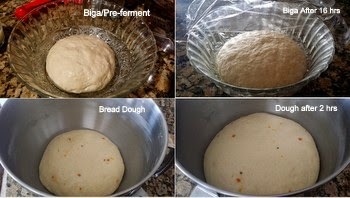 By this time the dough should have rise slightly and have a fermented look. The next morning make the dough for the Gibassier. Now In a stand mixer or processor bowl, add eggs(for eggless add milk), olive oil, orange juice and mix well. Then add flour, salt, sugar, yeast, biga and knead until the dough is smooth. After that add butter(cut into pieces) and knead well until the dough is soft and supple. Add the chopped candied orange, aniseed and the zest and knead till incorporated. Shape the dough into a round and place in a well-oiled bowl turning it to coat well. Cover loosely and allow the dough to double in volume. This should take about 2 hours. When done, turn the dough out onto your working surface. Divide it into 12 equal portions, shape each into a round and let the dough rest for about 15 to 20 minutes. Then shape and flatten each round into a semi-circle or oval. Make three cuts in the semi-circle, one in the center and two on either side of this cut from the straight edge to the arch of the semi-circle, by pushing your implement straight into the dough. Making sure the cuts open up into neat slits. Then using scissors, make 4 snips along the arched side at equal distance. Lift the Gibassier dough and transfer it to a parchment lined baking sheet making sure to stretch it a little so the cuts open up well and the slits also spread a bit. Repeat with all the balls of dough, and let the shaped dough rise for about 30 to 45 minutes till a little puffy. Then bake them at 180 C (350 F) for about 10 to 15 minutes till they turn a golden brown on top. Take the Gibassier out of the oven and brush them while still hot, with clarified butter/ ghee. Immediately press the brushed side down lightly (or sprinkle with sugar instead) into vanilla sugar or castor sugar. Then let them cool on a rack. Serve them slightly warm or at room temperature with coffee or tea. With milk alone the bread turned very soft, delicious and flavorful. I used only 2 tbsp candied orange peel and 2 tsp Orange zest. You can also replace candied orange peel with dried apricots. This is off to Aparna's We Knead To Bake # 19. 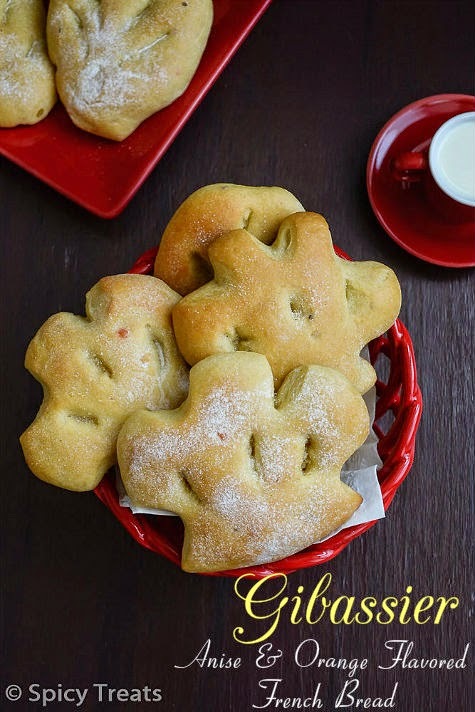 Gibassier looks super spongy and very cute..an incredible bread na..
Looks soo cute n perfectly made it! !